Being stranded in your vehicle with broken glass is a truly helpless feeling. Calling a tow truck is usually the first thought that goes through your mind. Getting a tow has transportation benefits, but it cannot solve your broken glass problem. 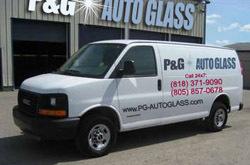 PG Sherman Oaks auto glass repair provides a fleet of mobile response trucks that arrive quickly to repair or restore damaged glass in your automobile. These professional technicians know that repairing or replacing your damaged automobile glass quickly is important for your travel and your safety. The prompt response of a technician to repair or replace glass is only the first step. The quality of replacement glass is important. Inexperienced companies often use cheaper aftermarket products. These products have a little to no warranty coverage. PG Sherman Oaks auto glass repair technicians use the OE glass that is recommended by your automaker. This ensures the highest quality and will help provide the required protection against future damages to your windshield, side and back window to increase your level of safety during travel. Many companies in various industries rely on timed delivery schedules that are created to fit the needs of clients and regular customers. A delivery vehicle cannot make daily deliveries with a broken or shattered window or windshield. Business owners depend on PG Sherman Oaks car window replacement services to quickly survey the damage, provide an accurate estimate and get drivers back on the road quickly. Private and commercial delivery trucks, city buses and other commercial vehicles easily benefit from this mobile auto glass repair. Automobile glass that is tested and approved by auto manufacturers can resist many dings, scratches and scrapes without breakage. Serious collisions and vandalism go beyond the automaker level of testing and damage can easily happen to windows. PG Sherman Oaks auto glass repair specialists easily repair glass that is repairable or replace windows that cannot be fixed. The installation is guaranteed for the life of the glass and will not leak. This same day and emergency service helps drivers avoid long delays and expedites the restoration process. If your auto glass needs to be replaced, our mobile service vans for auto glass replacement in Sherman Oaks carry manufactures OE quality glass to give you the best quality of auto glass possible. Some damages can be repaired and our technicians for auto glass repair in Sherman Oaks will repair the damage and bring the auto glass back to like-new condition. If you live or work in Sherman Oaks, CA in zip codes 91401, 91403, 91411, 91413, 91423 or 91495, contact PG Auto Glass whenever you need auto glass repair or replacements.